The One and Only Palmilla resort in San José del Cabo, located in the southernmost tip of Mexico on the Baja Peninsula, is as close to paradise as you can get. This exclusive ocean side resort provides butler service, immaculate and lush resort grounds and ocean views so stunning that during the winter months you can see whales and dolphins from the comfort of your room! 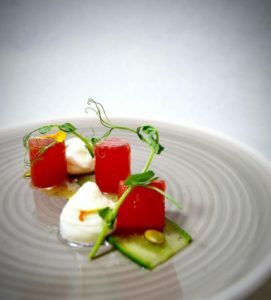 It’s so exclusive that it’s not abnormal to find yourself in the company of celebrities and boasts two restaurants by Michelin rated-chef Jean George Vongerichten and a third by Chef Larbi Darouch who apprenticed with the legendary French chef Jean-Louis Palladin beginning at age 13. The only thing that would make this experience even better would be to bring in a three Michelin star-rated chef from Napa for a pop-up dinner. Dinner on Ice—a pop-up dinner (presented by Capital One Cafe) featuring five-courses from MasterChef Finalist Chef Derrick Fox, cocktail pairings, ice skating and more—will take place at ICE at Santa Monica on Tuesday, January 16, 2018, 7:00 – 10:00 p.m.
A limited number of tickets are available for $100 in advance, and all inclusive of skate rental fee, dinner and open bar. Guests are encouraged to dress in cozy winter attire. Buy tickets via Feastly here. 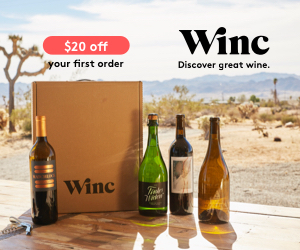 Want to get 20% off the event? 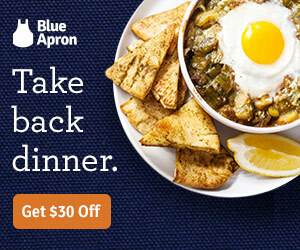 Enter promo code GIRLSONFOOD at checkout! This dinner offers a preview of Chef Derrick’s delicious and visually impressive dishes, which will be available at his new residency at Ma’Kai Santa Monica later this month. Join Julianne at The James Beard Foundation’s Fifth Annual Taste America! Calling all LA food-lovers! On Friday, Oct. 6, 2017, the James Beard Foundation will touch down on the West Coast for the Fifth Annual Taste America, the Foundation’s culinary tour through some of the country’s most exciting food cities. The festivities will begin at Vibiana and will celebrate Los Angeles’ food culture with esteemed local chefs and one national all-star, Barbara Lynch of Boston’s Gruppo, who will create a multi-course collaborative dinner with fellow James Beard Award winner Michael Cimarusti of Providence and Connie and Ted’s in Los Angeles, pastry chef Shannon Swindle of Craft Los Angeles, and host chef Neal Fraser of Redbird in Los Angeles. But before getting seated for dinner, guests will snack on an amazing lineup of bites from some of the finest local chefs, including Amanda Chapman and Johnny Ray Zone of Howlin Ray’s in Los Angeles, Evan Funke of Felix in Venice, Justin Hilbert of Maude in Beverly Hills, Sara Kramer of Kismet in Los Angeles, and David Schlosser of Shibumiin Los Angeles. This event will celebrate LA’s culinary arts scene and raise money for the James Beard Foundation’s Taste America Scholarship Fund during a silent auction and an exciting live auction. Want to get dapper and celebrate with us? Tickets are still on sale here. Are you ready to spend an afternoon in foodie heaven with former French Laundry Chef de Cuisine and current owner of Otium in LA, Timothy Hollingsworth? Myself (and the rest of Girls on Food) are so excited to join one of our favorite chefs for a special cooking demonstration at Macy’s Walnut Creek, in Walnut Creek, CA, where he will be sharing a few of his favorite recipes. Price: FREE! RSVP here to ensure a spot and receive a $10 Macy’s gift card when you check in! Before the demonstration I’ll be roaming Macy’s latest in cookware and gadgets for my kitchen. I’m thinking with that $10 Macy’s gift card, I could stock up on some early Halloween kitchen goodies. Also, with any purchase of $35 or more in the Home department, you will receive a special gift and a chance to meet Chef Timothy for a photo opp! I’m ready for my close-up! Oh my gosh I can’t wait! Like many Bay Area locals, I’ve been dreaming of dining at French Laundry, so to have him cook for us personally will be such a treat! When Julianne attended his recent Culinary Council demo in LA, I was watching the Girls on Food Instagram stories salivating over his cooking! Culinary Council is a collection of spectacularly talented chefs, pastry chefs, and food professionals that travel throughout the country and hold various tastings and demonstrations in Macy’s all over the U.S. Check with your local Macy’s to see if any are happening near you! I’ll be live on my Instagram feed with stories, so be sure you’re following me! A trend in the Los Angeles foodie culture is the concept of the pop-up restaurant which offers a limited time dining experience in a temporary space with a specific focus on a particular type of food. SAOR Project, started by Gianluca Zago and his wife Alessandra Manias, take the pop-up concept and aim to make it more of a permanent fixture, with monthly intimate meals and special dining events celebrating the best of classic Italian cuisine. I wasn’t sure what to expect going into the experience. But the word “experience” definitely sums up the evening. This was one of the most memorable dinners I’ve had in a very long while, and not just because of the excellent food. It’s difficult to focus on how you are eating when you are so much more focused on what you are eating. Steph Jensen, whose background is rooted in health and wellness, is well aware of this. In an effort to educate others on why focusing on how you eat is important, she started a whole dinner series focused on mindful eating called The Gramercy Garden Eating Club. For her club, she teams up with local New York City chefs to bring her guests a “mind-to-table” experience right in her own private NYC patio. The dinner I attended was cooked by Micah Fredman who has cooked in incredible NYC restaurants including Gramercy Tavern and Eleven Madison Park. 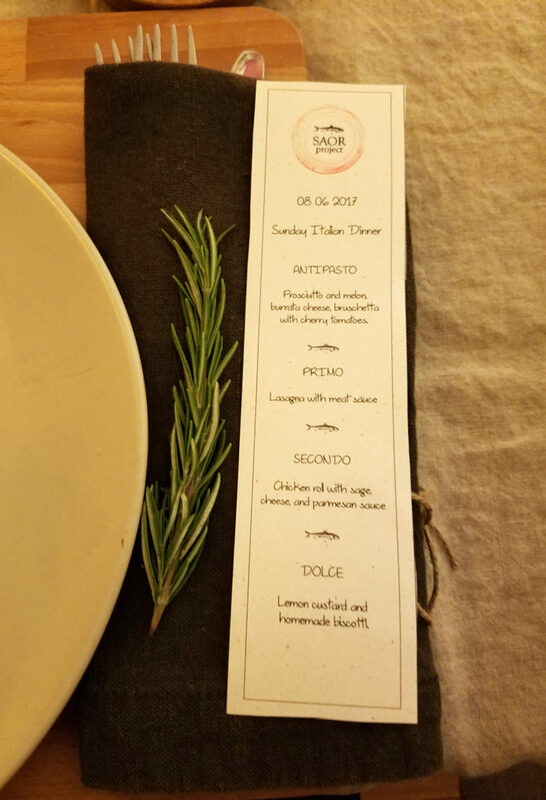 The night was full of an incredible paleo/pescatarian menu, approachable guests and eating tips that are simple enough for any foodies to follow. All ingredients used for this dinner were picked from the farmer’s market the morning of the dinner, so the freshness of the vegetables really stood out during the meal. 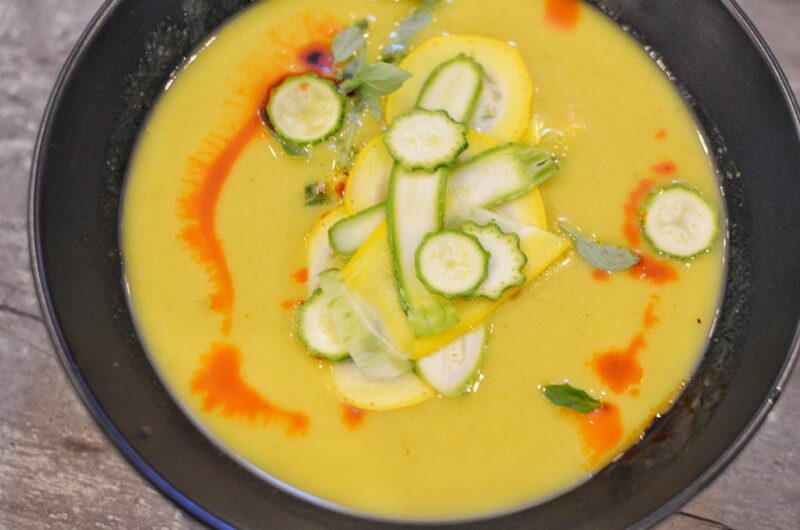 Chilled squash soup- The chilled squash soup was perfect for a hot summer night, with its smokey finish from spices. It was a great opener to the rest of the courses leaving you not too full but instead, excited for what’s to come. 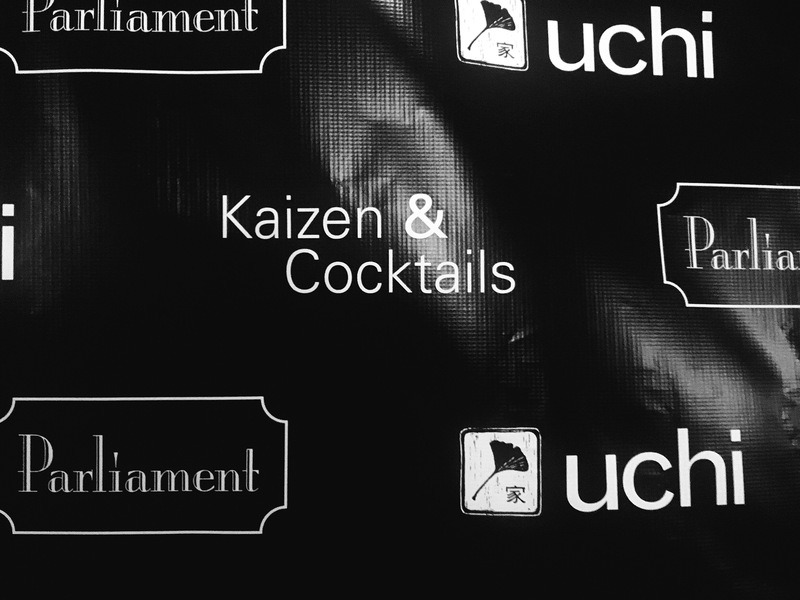 Three forces collaborated to produce one heck of an event dubbed Kaizen & Cocktails. 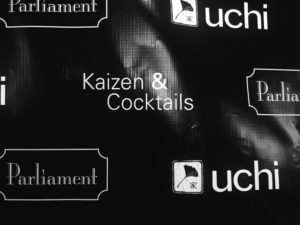 The Uchi Dallas team brought their culinary smarts to the Parliament team of all-star Adult Beverage Chefs (I suspect they hate being called mixologists) for Japanese-inspired cocktails and food all in the name of charity. A $25 ticket gave guests a choice of one out of five out-of-this-world cocktails and unlimited bites from Uchi. 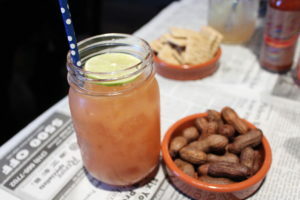 While that price seems quite high for one cocktail – additional drinks only cost $5 each – 100% of the proceeds went to an outstanding non-profit, Promise of Peace Gardens (P.O.P. ), a group that transforms unwanted land into thriving gardens. Additionally, P.O.P. teaches low-income families about sustainable living and portions of produce grown in P.O.P. gardens supply several Dallas-area food pantries. Eddie “Lucky” Campbell, the mega-star Dallas bartender with a personality to match tells it better here. How did this idea come to fruition? Hold on tightly…Elizabeth Dryer, founding director of P.O.P. tells me that Alex Astranti, current Chef de Cuisine at Uchi Dallas leased two garden plots from P.O.P. when he worked at Top Knot. According to Dryer, Astranti and his team would come to garden while his wife and baby sat on a picnic blanket. Astranti then moved to Uchi and met current Uchi Sous Chef Chad Graybill, who falls in love with Parliament upon moving back to Dallas. Listen to Graybill describe the rest of the story here. 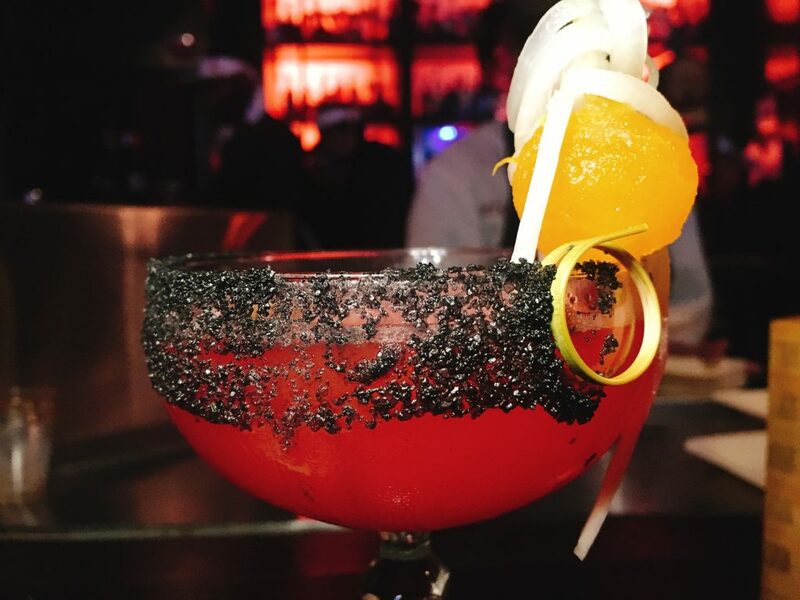 Black lava salt, watermelon and tequila. I am so excited for Nerano and Marchesi Antinori‘s Italian Wine Dinner in Beverly Hills. For this dinner, Executive Chef Michele Lisi and Sommelier Samantha Johnston of Nerano team up with Wine Ambassador and Sommelier Alessia Botturi of Marchesi Antinori. This five-course dinner tasting menu paired with Italian wines by Sommelier Samantha Johnston will commence on Tuesday, July 18, 2017, at 7 PM, in The BG Lounge. The evening reception begins with Stuzzichini – Crostino Di Pomodoro Verde with Apulian Burrata & Green Tomato Marmellata and Bruschetta with Grilled Rustic Crostino, Diced Campari Tomato, Arugula & Parmigiano Reggiano paired with Col de Salici Rosé Brut NV. Followed by Antipasti – Crudo Di Ricciola with Pacific Yellowtail, Crispy Capers, Fresno Chili Peppers, Rainbow Micro Greens & Citronette paired with Tenuta Guado Al Tasso, Vermentino 2015; and Burrata Caprese with Heirloom Tomatoes, Apulian Burrata, Tomato Confit & Arugula-Pesto paired with Castello Della Sala, ‘Cervaro,’ Chardonnay 2014. Next is the Pasta course of house-made Orecchiette with Colorado Lamb Ragú, English Peas, Tuscan Mint & Fiocchi di Burrata paired with Guado al Tasso, ‘Il Bruciato’ 2015. For Secondi – the main course – Tagliata di Manzo, USDA Prime New York Steak with Yukon Gold Potato Focaccia & Sautéed Spinach paired with Antinori ‘Tignanello’ 2014. Completing the dinner is a Dolci of Panna Cotta e Frutti di Bosco – Tahitian Vanilla Panna Cotta with Fresh Wild Berries, Orange Zest & Vin Cotto paired with Fattoria Aldobrandesca, ‘Aleatico’ 2011. I will be on our Instagram @girlsonfoodblog providing stories and live content, so make sure you’re following us! A couple of my favorite things: Wölffer Rosé, Wölffer No. 139 Dry Rosé Cider and jewelry! Whenever I’m in NYC and dining out, I always order a glass of Wölffer Estate’s Rosé and/or my absolute favorite, the No. 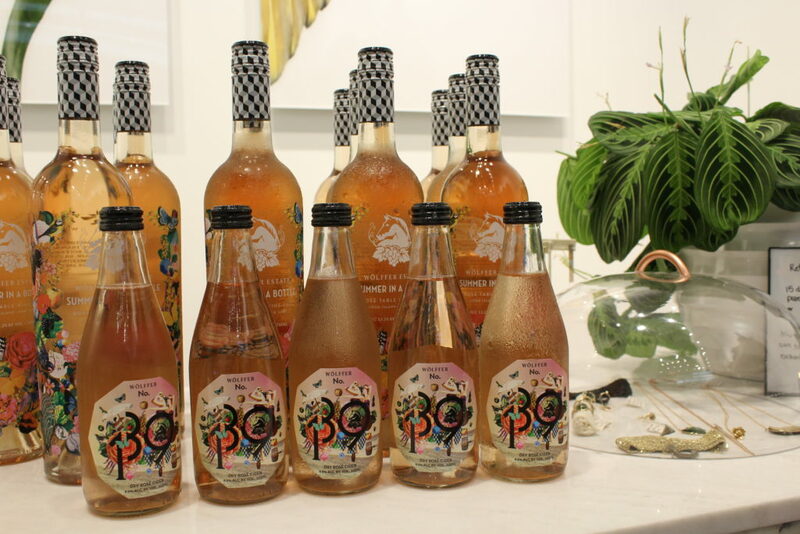 139 Dry Rosé Cider. It’s very common to find in NYC restaurants and bars. I’ve always wanted it to come over to the West Coast though! 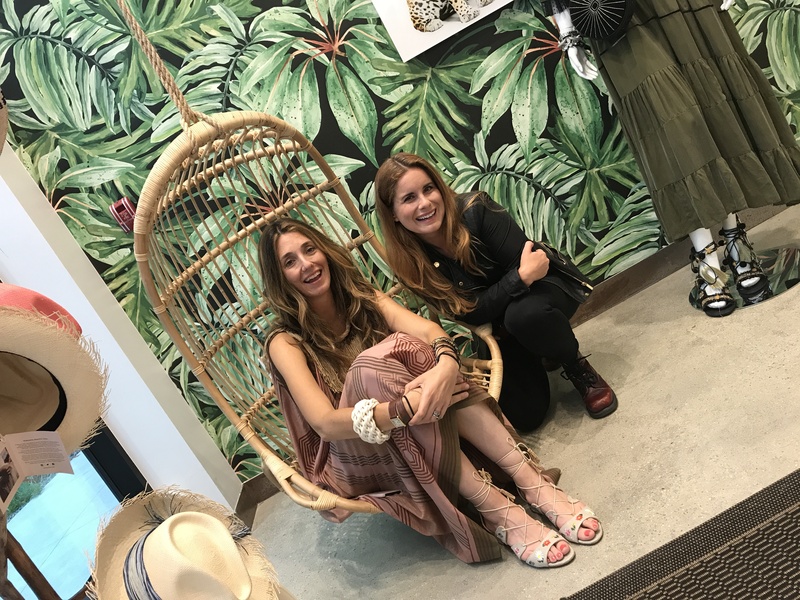 While Californians still can’t purchase Wölffer Estate wines in their own state, we do have time to shop for new clothes at Co-Owner Joey Wölffer’s pop-up, The Road We Travel at Platform LA. Joey curates a Hamptons-meets-boho collection from an array of her favorite luxe designers. 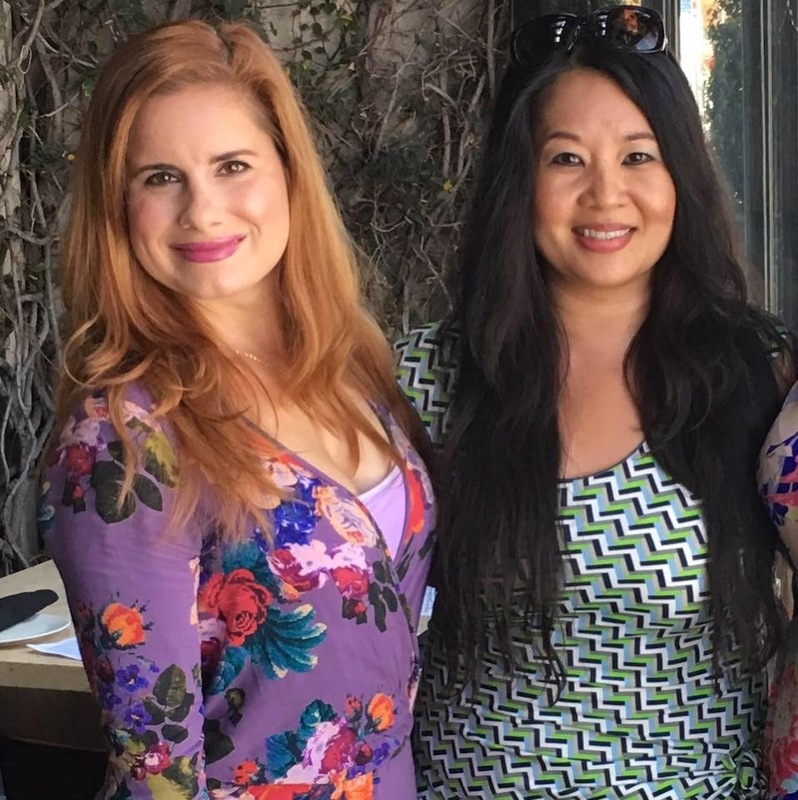 If we can’t sip on a glass of Wölffer Estate Rosé in LA, we can at least dress like we do! I had a moment to chat with Joey about this pop-up among other things. JG: How will this pop-up be different from your Sag Harbor and Nantucket locations? If you keep up with my posts here at GOF, you know that Tavern was one of my old stomping grounds when I lived in Brentwood. Tavern has one of the most beautiful patios in all of LA, but it maintains an easy-going vibe. The Larder at Tavern, their cafe, serves coffee, tea, pastries and grab-and-go items. Whether you’re grabbing a quick bite or having a dinner date with your significant other, Tavern is one of the most consistent restaurants in LA. Today, I explore a different side to Tavern, a more down home cooking side. Recently I attended an exclusive media preview for Tavern’s 4th Annual Low Country Boil, which will take place Sunday, June 25th. Chef de Cuisine, Amy Deaderick hosts this boil which the Tavern owners Suzanne Goin and Caroline Styne fully endorse. This annual boil is very personal to Deaderick, who grew up in South Carolina. Memories of her childhood and the Carolina culture inspire every course. For $65 per person, this one-time event will be set in The Larder at Tavern, serving up three courses and dessert. South Carolina-based musicians Josh and Leslie Roberts will be providing live acoustic folk-country tunes to really set a “dining by the shoreline” ambiance. The Communal tables are covered with newspapers and -warning- you may get wet, so come out in your “eatin’ dress”. Tickets are still on sale for the LA Food Fest! Check out their site here. We hope to see you there! We were given a glimpse at all the goodies that are in store for the LA Food Fest, June 10th, 2017, 2 – 7 PM at LA Memorial Coliseum, 3911 South Figueroa Street, Los Angeles, CA 90037. Get out those #stretchypants! The LA Food Fest always features award-winning chefs and restaurants, plenty of food stands, food trucks and carts, a beer garden, cocktail bars, coffee, desserts… basically everything under the sun! For the $65 general admission ticket, LA Food Fest offers 100+ food and beverage vendors. 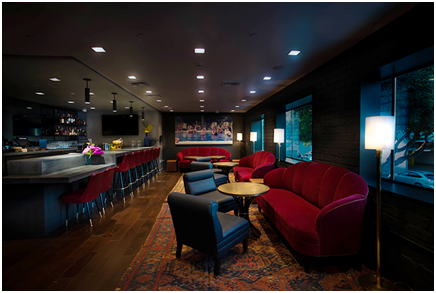 For the $95 VIP ticket, attendees are given early entry and access to the VIP Lounge. We were at LA Food Fest last year and this year, we’re even more excited because many foodie businesses we’ve featured on GOF in the past are going to be there serving up bites. It’s always good to see your friends! There will also be some new faces, and we’re excited to see them as well. 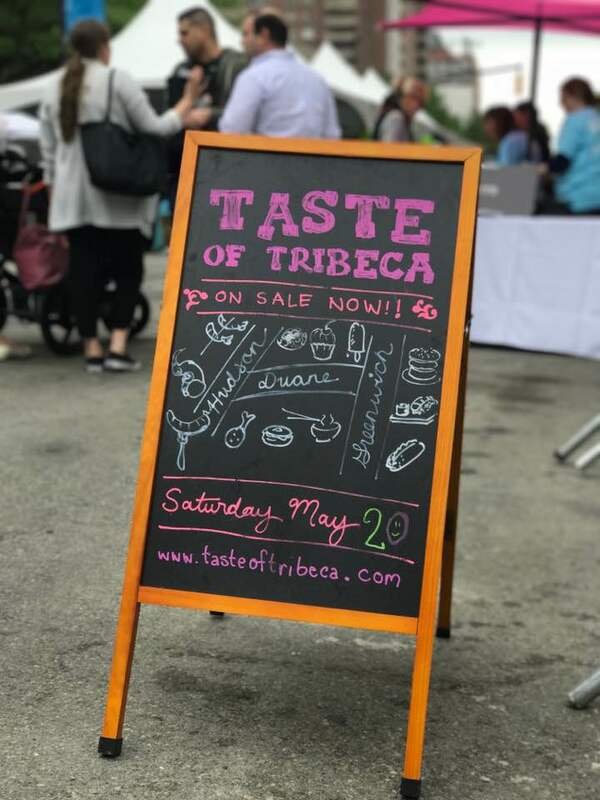 It was Saturday afternoon and the skies were grey but the crowd was bright and cheery because Taste of Tribeca was in full effect. 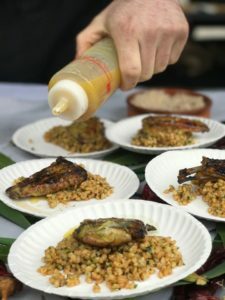 With over 60 participating vendors and endless plates of delicious goodness, the streets between Greenwich Street and Hudson Street were lined with what seemed like unlimited small plates of some of the best chef’s creations in New York City. Everything from scrumptious Steak Tartare at American Cut, to an entire ice cream cone filled with a cold creamy concoction at The Odeon, to an entire Pulled Pork Sandwich at Walker’s, there was something for everyone and then some. Some of my favorites included Grilled Chicken Wing Over Ancient Grains and Ramps by Marc Forgione, the Mini Bagels Topped With Lox by Zucker’s, and of course a perfectly prepared slice of pizza by Bar Cyrk (well, because this pizza princess can’t go anywhere without indulging in her kryptonite). Sometimes I think I am a large man who can eat endlessly, but unfortunately that is not the case. Despite me telling my self I could do it, and wanted to do it, I simply could not sample all the tasty treats at the festival. Oh, the struggle.